So finally heard from one of my readers ” Hey, how come you stopped writing about your trip”. Well seems with all the commotion of the move around here, also getting away for awhile scouting out spots for wild camping and trying it without any electronics at all gave me the perfect reason to procrastinate. 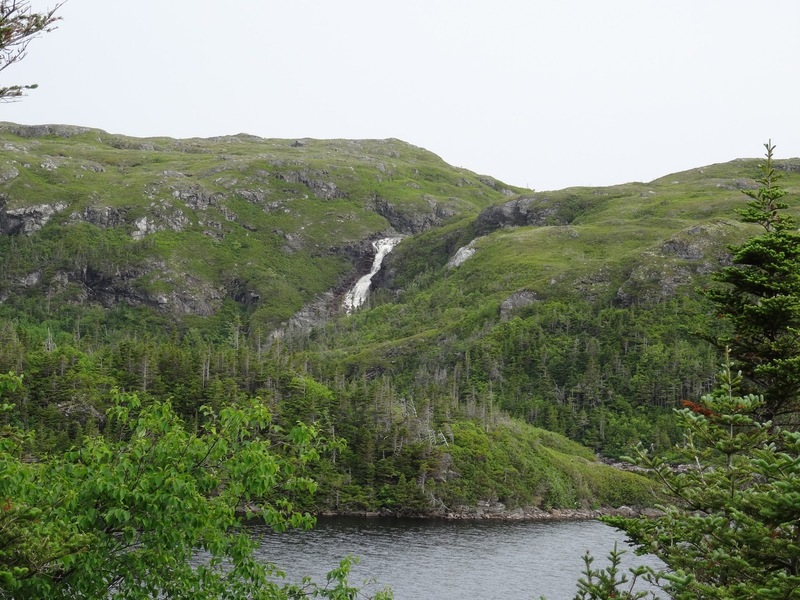 However, what it really boiled down to was I had to maul over in my mind how I could possibly put to paper something that would do justice to just how remarkable Newfoundland really is. 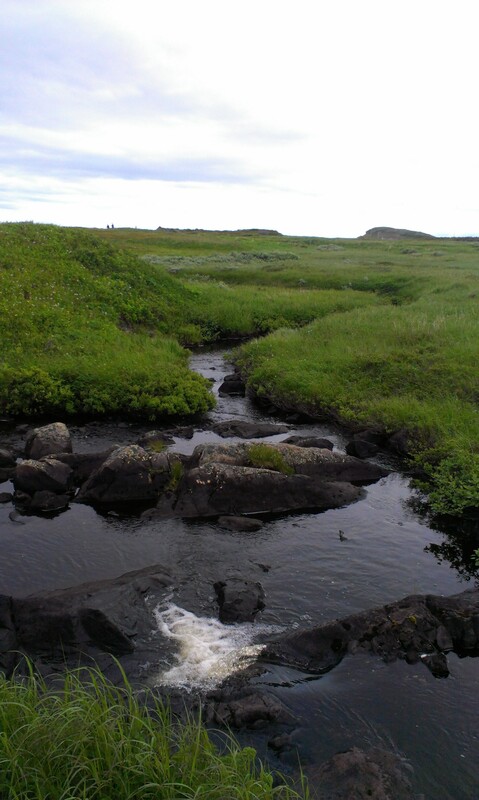 Sometimes when you are travelling you just need to stop and find something that captures a place or go to a location to find those perfect photographic shots However, I did not find that about Newfoundland. It was just blatantly right in your face all the time. From majestic mountains, to tall cliffs, to barren landscapes of exposed Canadian shield that was literally covered with different types moss’s and lichens. 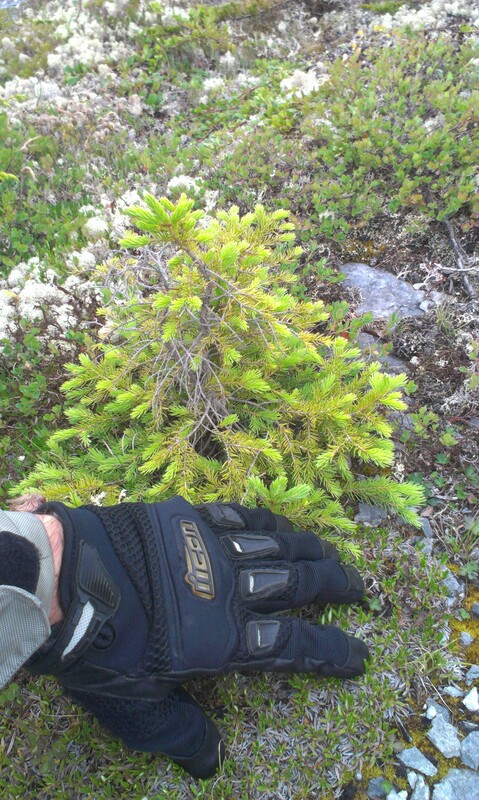 The Island is covered with Red pine, but even they are stunted from such a short growing season. 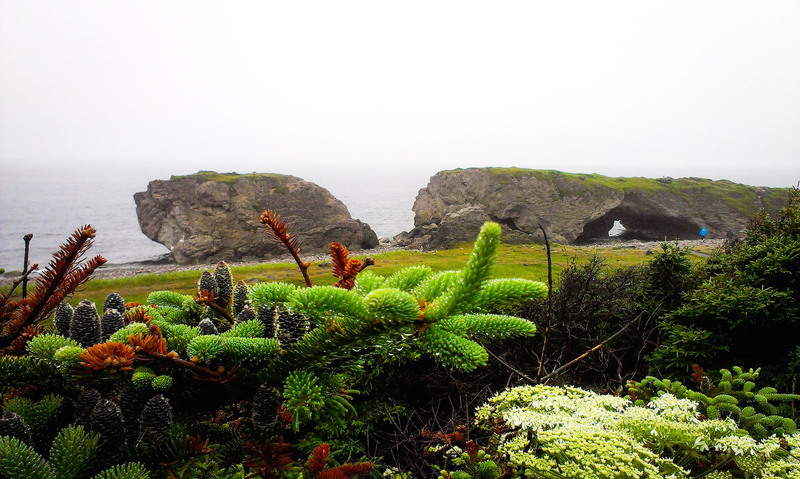 Some places the trees where only 12-18 inches tall, and surround by other small shrubs. You didn’t need to drive to a ” special” location to find fishing boats lined up along the shore or brightly painted clapboard finished house. I literally could have stopped every ten to fifteen minutes to take a photo of something else. 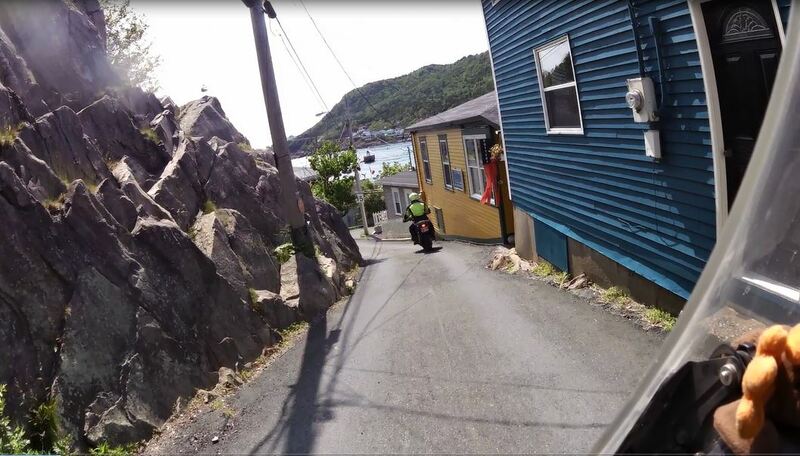 Even the big cities like St. John’s with small winding streets that went up and down the sides of the cliffs with house snuggled into little nooks and crannies along road, and cliffs offered a taste of Canada that cannot be found anywhere else. It truly was a spectacular time. As majestic as the photo are below that is pretty much what you see everywhere. It is so cute. 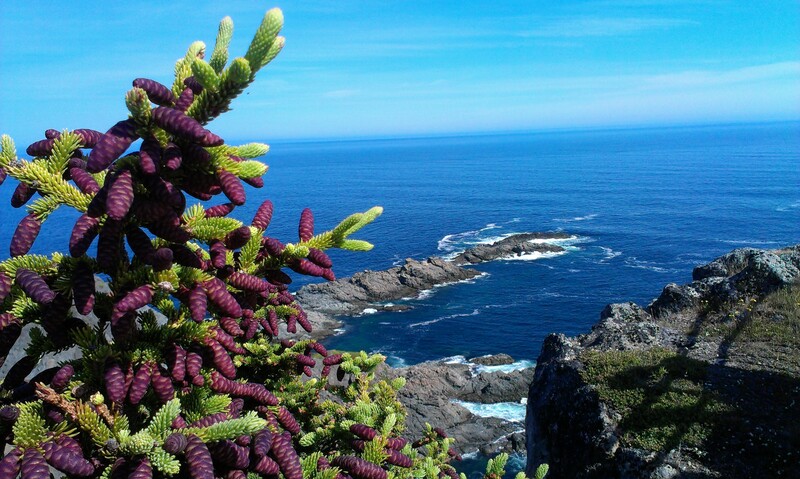 These mature pines are everywhere along the wind blown coast. I’m sure NFDL invented the pine bonsai tree. Inland you had wonderful mountain views. 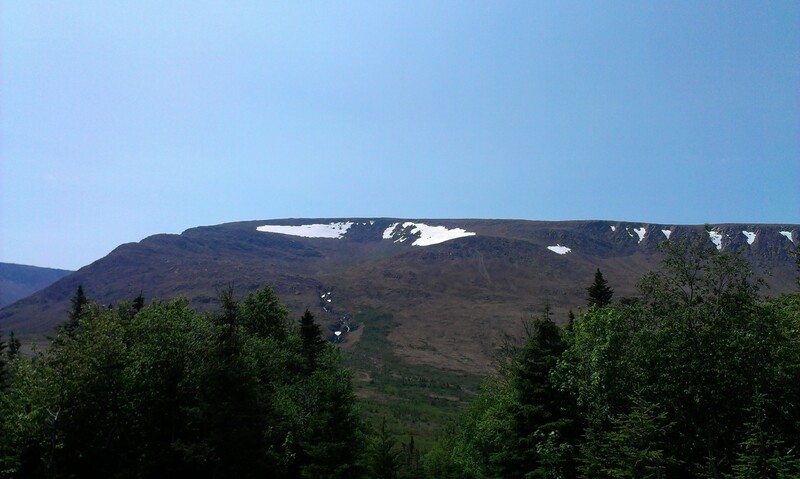 July and there is still snow up there. Now my turn to insert myself and my two friends into this wonderful place. The only way on and off the Island……. Let me stop and clarify the word ” Island” first. Often when the world Island is used we conjure up something small in our minds. 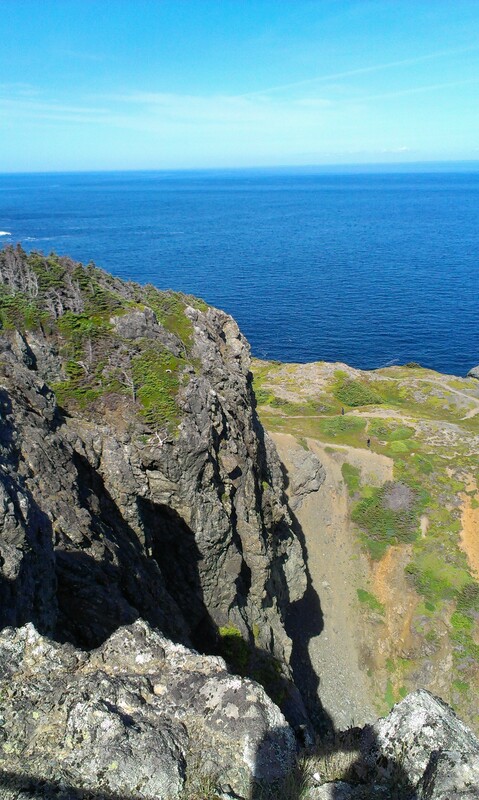 Newfoundland is anything but small. 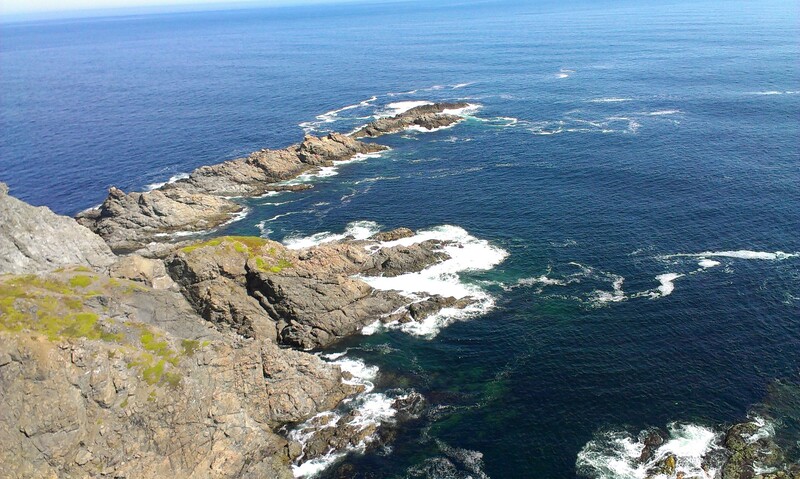 It is 111,390 square km’s and is larger than Nova Scotia, New Brunswick and P.E.I combined. As a local ADV rider told us. He has lived there his whole life and still has not driver all the trails or roads that NFDL has to offer. So we arrived by ferry. 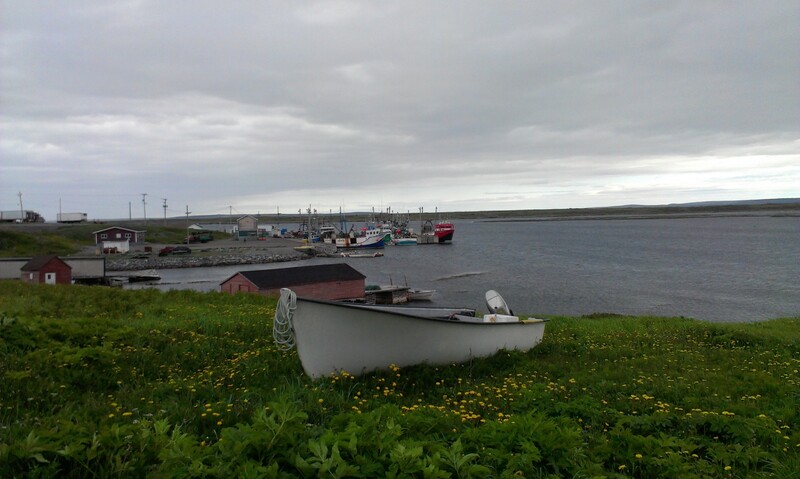 We had left the night before at 11:30 p.m from Nova Scotia and had arrived at 7:00 am in Port Aux Basque. The ferry ride was smooth, but very little sleep was had by any of us. From loud truckers, drunken passengers, and uncomfortable sleeping arrangements sleep was hard to come by. 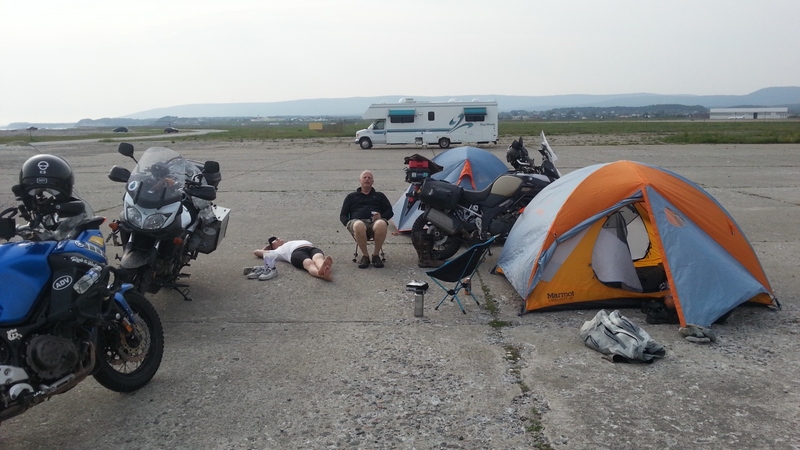 Once we arrived we had to take care of a broken headlight on Joe’s bike. Port Aux Basque had everything a good sized Canadian town had so off to Canadian tire we headed. Joe was busy at work on his bike while Jeff and I found a cozy little lounging area on some bags of peat moss in front of the Canadian tire store. 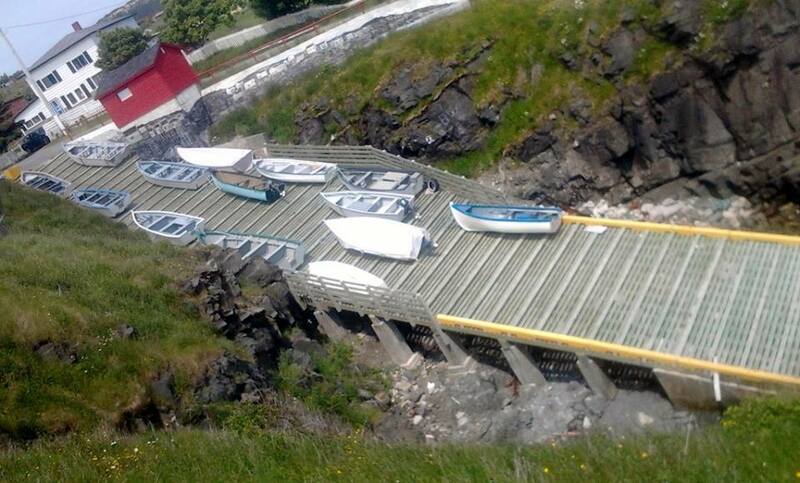 It was only a matter of minutes before we found out how truly friendly Newfoundlander were. We met some of the nicest people who would just walk up to us and start a conversation with us like we were there long time ” uncle Jim”. 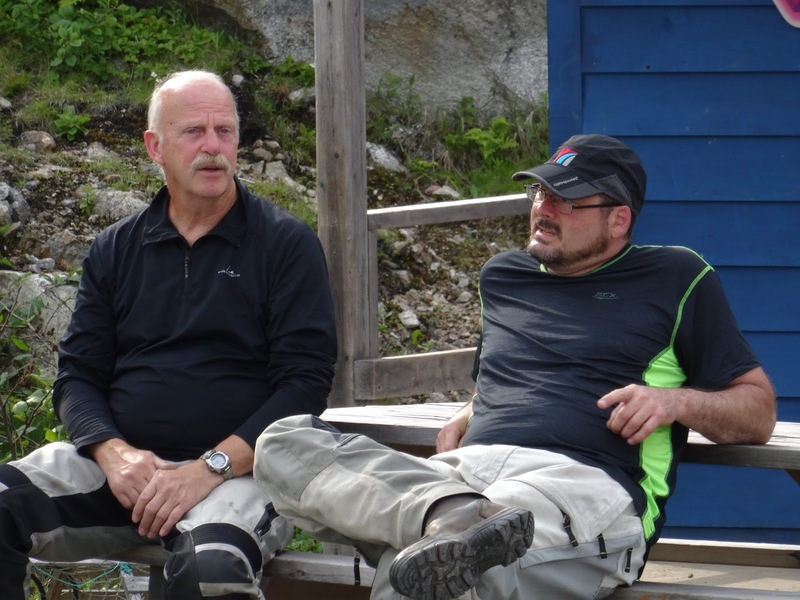 The conversations just flowed so naturally, in spite of the accents and colloquialisms that were used. This happened every where we went. I don’t think there was a single stop that we made where someone did not come up to us to start a conversation. To be honest, at times, we would keep our head down to try and avoid conversation if we were in a rush to get somewhere. However, it was always refreshing and we learned so much about NFDL and people this way. Once Joe had finished his headlight repair we headed out. We were wisely told that once we reached the Island that instead of talking the Trans Canada Highway and being stuck behind hundreds of other trucks and vehicles that had just unloaded from the ferry ( it was a big big ferry) to hang right an d take a two hour detour that would bring us along a road that meandered the coastal tip of NFDL. This route was spectacular. It felt more like we were driving in Ireland than Canada. It was barren but lush at the same time. There were very few trees and very evident why it was nick named ” The rock”. There was lichens and moss growing over the Canadian shield with short bushes growing all over the place. The guys and I kidded with each other that we would not be surprised to to find Froddo Baggins come walking up a long the road to greet us. This little detour led us up to a small little village with a very unique lighthouse at the end. It was not your traditional red and white wood/cement one. This was was built of the local rock and blended in to the scenery, Other than the light it didn’t really prove to be much of a marker. Everything was just so clearly different from any other part of our trip. Part way to the lighthouse off in the distance, rather too far too walk, but at least we could get a nice photo was a large waterfall. Just a glorious view. I’m not sure if it was just the fact that I had only slept less than 3 hours in the last 24 hours but I just felt so emotional about everything around. It felt like my senses were being overwhelmed. Again I will hearken back to the idea of stepping off a plane in a strange but wonderful new country. The sights the smells the environment was all so new. Once we reached the little town there was a ” toll” to walk up to see the lighthouse. We decided not to go up, but there was a nice washroom and not having had an opportunity to shower on board the ferry we decided to freshen up a little. Then we just hung out for a little while chatting and resting our weary bodies. Realizing that taking this detour was well worth the time. After getting some rest we headed off back to the Trans Canada Highway to start making our way to wherever it was we were going to go that day. We only traveled a few hours before making it to Stephenville. This town was built around a very large old US military airbase. It was decommissioned in the 60’s sometime. The US used to always have a large presence in Newfoundland. 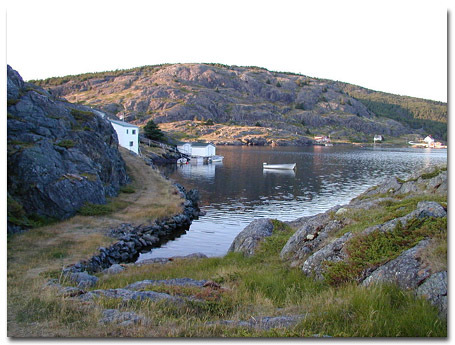 Up to 1949 Newfoundland was independent but was a strategic point during WWI and WWII to both intercept and send off ships and flights coming to and from Europe, so the US had strategically placed defenses and airbase all over the Island. In 1949 NFDL held an election to see weather it would join Britain, Canada or the US. Canada won but only by a very small margin over the US.The story any Newfoundlander will tell you is that they do not join Canada, rather, they allowed Canada to join them. We all decided at that point that we should find a camping spot and stop for the day. We were all pretty beat and needed a good nights sleep. We found a nice spot at the end of one of the runways just just across the road from the ocean. We were camping on concrete but the view was spectacular. There are advantages and disadvantages to camping by the beach. One disadvantage is those gale winds that can come up quickly. The next morning while packing up we ran into one of those disadvantages. Both Joe and I found ourselves chasing out tents down the run way as the winds had picked them up and started carrying them away. It was all good. We were both able to catch them before they blew completely away. Refreshed we headed out. Destination for the day was to make it to St.Johns’ where we were expected by Dave Murphy aka DaMurph on the ADV riders forum. 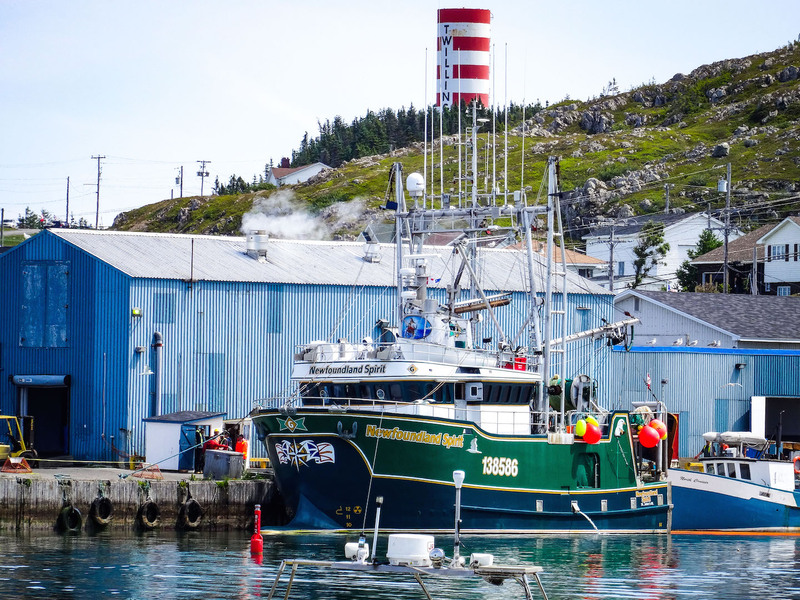 It was close to 750 km’s to St John’s from Stephensville. However, we did not plan on taking the Trans Canada Highway. That would be just too much tarmac. 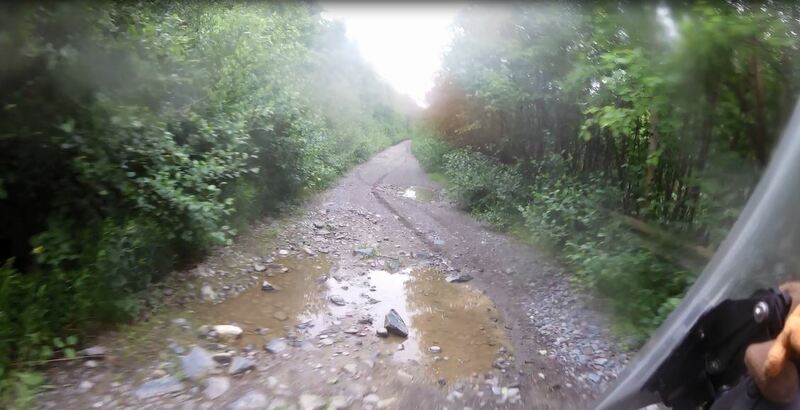 So instead we opted to cut cross country on some off road trails. The trail was about 150 km’s long and from what I could gather was used mostly by hunters and was a service line for the hydro wires. Some areas were nice and wide while other were a little more sketchy. 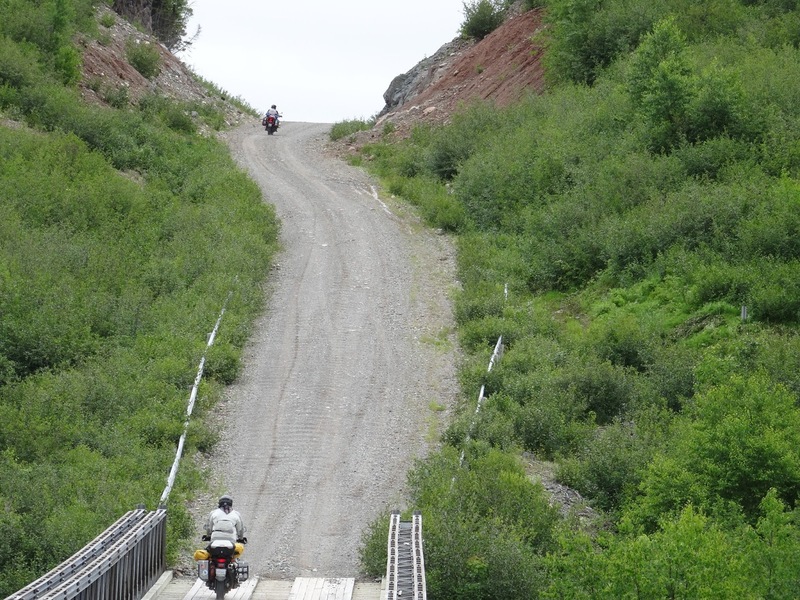 By the time we had finished his section of track we had cut about 200 km off the trip for the day but had added about 3 hours of riding since it was a little slow going. 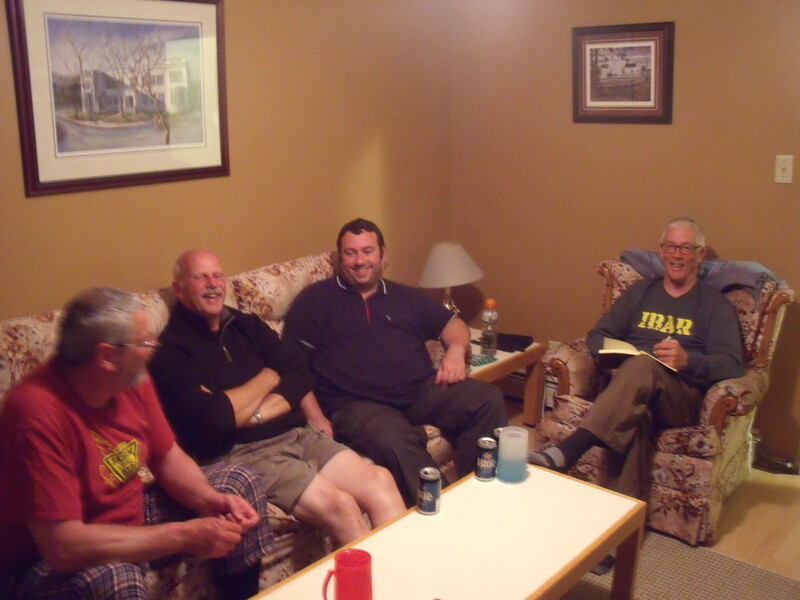 We arrived at Murph’s around 7:00 in the evening and with his thick rich Newfoundland accent greeted us with a ” boys just drop your stuff here and make yourselves at home, dinner’s ready” and that was that. Right from the get go that home felt like our home. 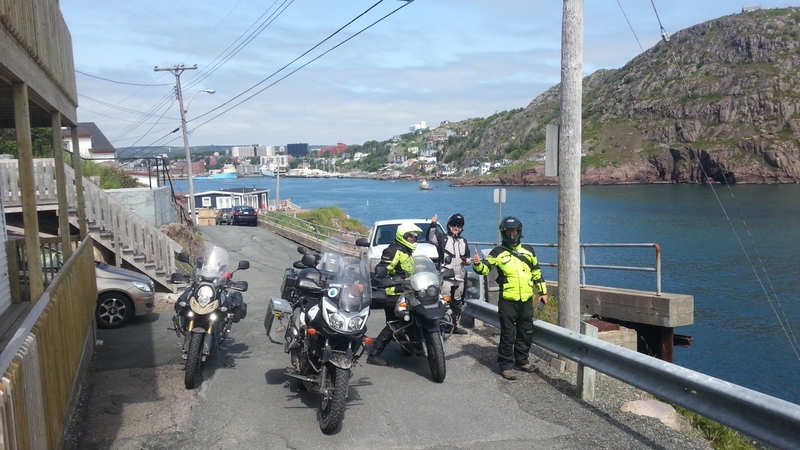 We had been greeted by the ” unofficial” ADV motorcycle tour guide and welcome wagon for Newfoundland. We quickly got out of our wet gear, and hung it around the fireplace that Murph had just stocked full of wood to make his place especially warm for us. Murph and his girlfriend pulled a nice whole chicken from the oven and laid it out on the kitchen table and told ” I may have cooked it lads but I’m not going to serve, come help yourselves.”. So after having filled our bellies, had us a nice warm shower and settled in we all gathered in the living room to hear the ” lore of the Island”. The next three days with DaMurph was going to prove to be the best time I had on the island. 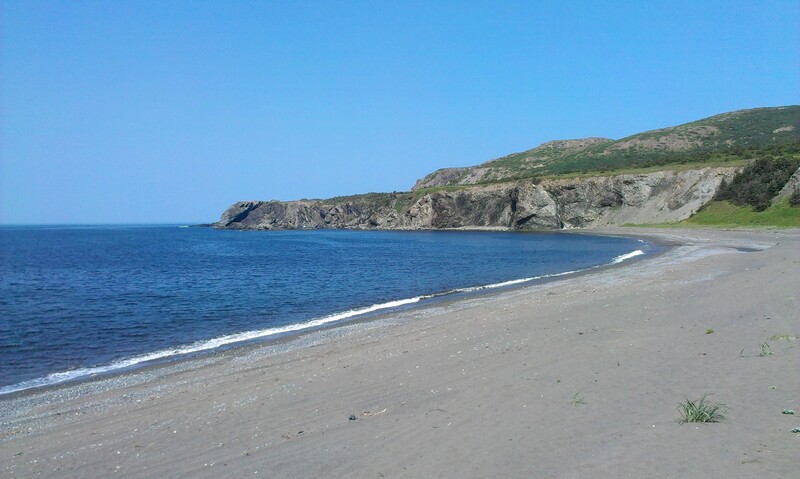 As I figured I would not be able to do Newfoundland in one post. I don’t want to bore anyone by going on and at the same time there are just so many great stories of Icebergs, remote areas, Caribou kills, the Vikings and more. 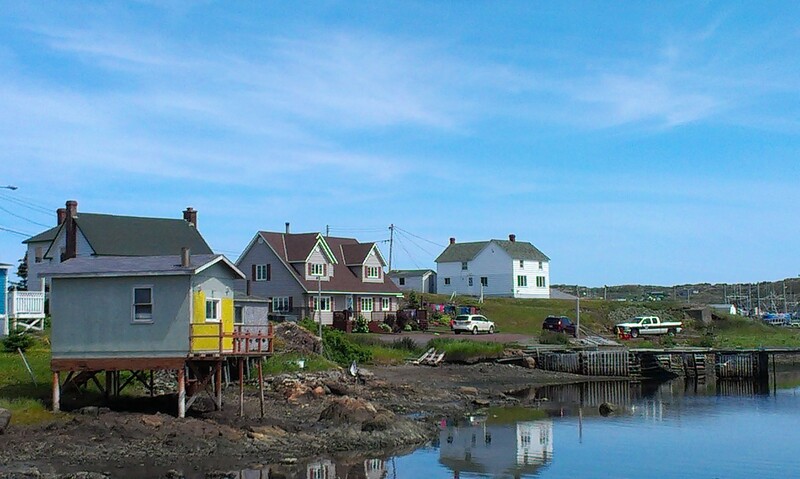 So, I promise I won’t procrastinate so long this time and get the last Newfoundland post out soon. Thanks Chad. 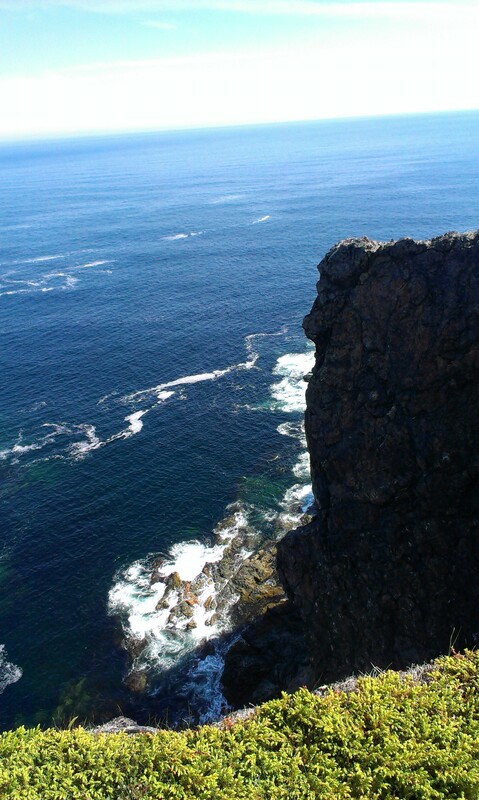 Newfoundland was spectacular. I would love to go back someday.